Wrentham is a fairly large village, a town that failed to grow really, with surviving signs of its 18th and 19th Century prosperity that include its town hall, a reading room, a coaching inn, and this fine structure set away from the main road. The village straddles the A12 just before you reach the hinterland of Lowestoft and enter the perils of the Diocese of Norwich. Not that this will bother the good people of this chapel, of course. 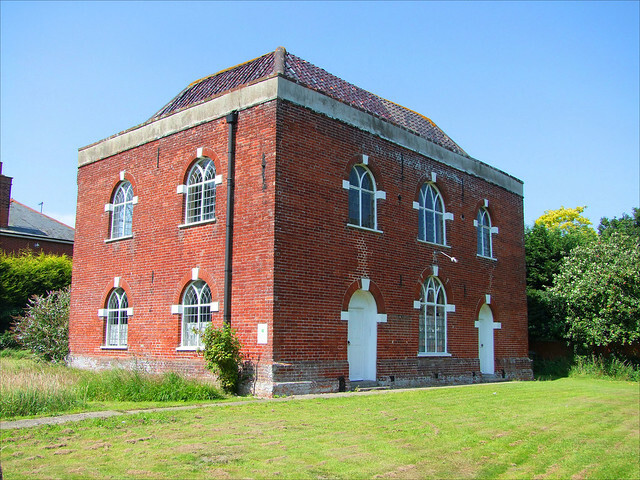 This handsome building was constructed as a Congregational chapel in 1778, probably by the Wrentham master builder John Owchin, says Pevsner. The interior is said to be still relatively complete. The congregation actually dates back to 1649 when it took over the medieval parish church of St Nicholas under the Commonwealth's suppression of the Church of England. After the Restoration they worshipped in another building, which this chapel replaced. At the time of the census of religious observance on Sunday 30th March 1851, at the start of a decade in which the populations of many East Anglian villages were reaching their peak before a haemorrhaging to the towns and cities, there were just over a thousand people living in Wrentham. There were four places of worship, including this one and the medieval parish church. There is a strong tradition of non-conformism in this part of Suffolk, but here in Wrentham the Anglicans were doing fairly well, with both the Congregational Chapel and the Parish Church managing about 120 people each for the Sunday morning service and about 280 each for the afternoon sermon. The two Methodist chapels, Wesleyan and Primitive, accounted for another 80 between them on that Sunday morning, and so here we have a situation where more than half the population of the village were churchgoers, an unheard of proportion in Suffolk where by the 1850s barely a third of the population were attending Sunday morning service, and in some areas this fell to a tenth. Perhaps the attenders at the Congregational Chapel were gathered from a wide area, or perhaps they were merely a devout lot around here in those prosperous, optimistic days of the young Queen Victoria.